It’s going on six years since Charles Martin’s enthralling page-turner The Mountain Between Us was earmarked for a big-screen adaptation and in that time, 20th Century Fox considered a raft of Hollywood talent to anchor Martin’s story of survival, romance, and the unwavering power of the human spirit. Toward the beginning of pre-production, Alien: Covenant‘s Michael Fassbender flirted with the project, before being replaced by Charlie Hunnam on Fox’s wishlist. Those negotiations didn’t result in any official deal – ditto for Rosamund Pike – and it was only last year when 20th Century Fox finally settled on its two leading stars: Kate Winslet and Idris Elba. Recruiting an Oscar-winner and a magnetic screen presence in Elba? We’d venture that the prolonged wait has been worth it. And so, with the first trailer due to land sometime this week, USA Today has unearthed four action shots from Hany Abu-Assad’s feature-length adaptation, which finds Elba and Winslet stranded in the Canadian cold. 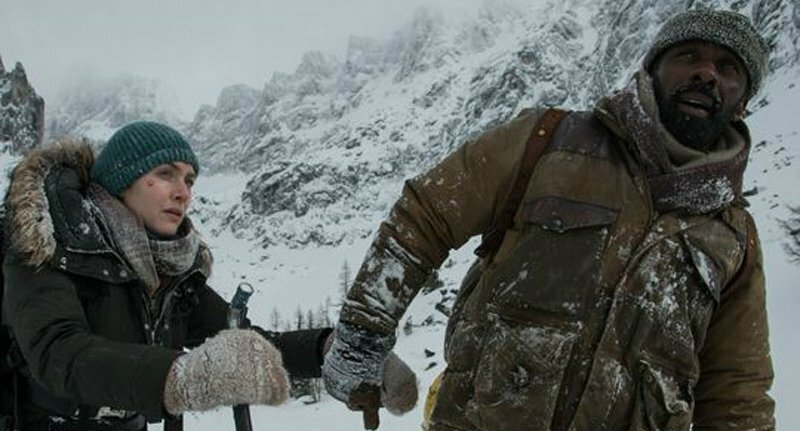 Not unlike, say, Baltasar Kormákur’s Everest, the vast majority of The Mountain Between Us was filmed on location in the icy hills of Canada in order to instill an added sense of realism into the story of Ben Bass (Elba) and Alex Martin (Winslet). I think optimism and hope is crucial to survive. And to go on with your life even if you’ve had a lot of bad luck. So if you give [in] to the bad luck, you will die. (But) if you fight the bad luck, you have a better chance to survive and make your life better. This is very simple wisdom, yes? But still very crucial especially in these kinds of days, when everybody feels entitled to their good luck. Together, Kate Winslet and Idris Elba will scale The Mountain Between Us when Hany Abu-Assad’s nail-biting romantic drama opens on October 20th of this year. The first trailer is expected to come in out of the cold later this week, so keep your peepers peeled on WGTC for more.